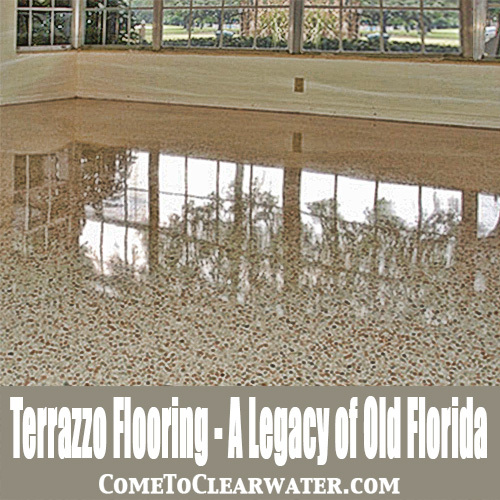 Terrazzo flooring has a long history and with the heavy influence of Spanish and Mediterranean architecture in Florida, is rather popular. Look around and you will see it in all kinds of places, buildings, businesses, homes and walkways. Terrazzo is a composite material, poured in place or pre-cast, which is used for floor and wall treatments. It is made from marble, quartz, granite, glass or other materials in chips, held together with a binding material. Terrazzo is laid, cured and then ground and polished to a smooth surface. It looks beautiful, and like it should be bumpy, but has an amazingly smooth, yet textured surface. Terrazzo artisans create walkways, floors and patios by exposing marble chips and/or other aggregates on the surface of finished concrete or epoxy-resin, almost like it was sprinkled into the concrete. Terrazzo flooring was originally invented by Venetian construction workers. Large slabs of marble were heavy and expensive. Terrazzo was a low cost flooring material using marble chips from jobs they had done. The workers would usually set them in clay to surface the patios around their living quarters. When first invented, the floors would be made from marble chips, clay, and goat’s milk which was used as a sealer. Obviously as time and technology has improved, production of terrazzo became much easier and relied less on goats milk! While the modern versions are Venetian in origin, archaeologists use the word terrazzo to describe the floors of early Neolithic buildings (9,000–8,000 BC) in Western Asia, eastern Turkey and other ancient middle and far eastern cultures. The floors are very durable, surviving thousands of years. Today’s terrazzo floors may not last thousands of years, but the beauty that they add to any room, home or building will make it seem as if they have been there for centuries!